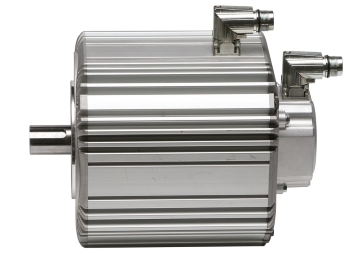 Bison Gear & Engineering Launches VFsync, a Next Generation Permanent Magnet AC Motor. Bison Gear and Engineering has launched its VFsync, a permanent magnet AC motor. The synchronous motors sport an IP66/IP54 platform that range in power from .25 to 1.5 hp, and are supplied with swivel connectors and shielded cables. Popular frame sizes include IEC B14, sizes 71, 80 and 90 along with NEMA 56C mounting. The product line includes the motors, quick connect cables and a market leading, programmable and networked VFD available in an IP 20 panel style or enclosed IP66 models. VFsync motors are designed to work with Bison Gear & Engineering’s line of integral horsepower gear reducers. Each frame size is available in either 230 or 460V construction, and either TENV, TENV w/encoder or TEFC styles.